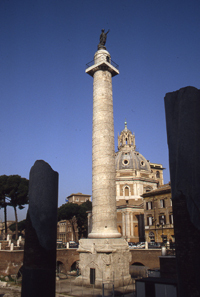 This is a website dedicated to Trajan’s Column in Rome (inaugurated in AD 113) and based on Jon Coulston’s photographic archive. The Column is the most influential and published single monument in Roman art and architecture, and the archive was initiated during study of the sculptural content of the marble reliefs from scaffolding, starting in the early 1980s and continuing into the future. The first stage is a searchable image database of the helical frieze of the Column shaft. As the site expands it will encompass the reliefs of the Column pedestal and the buildings of the wider monumental complex. It will present interpretative essays, bibliographies and links to other monuments and resources. It also introduces numbering systems for the 2,662 human figures on the frieze and the 542 items of barbarian equipment on the pedestal.